After WWII, every so often a Japanese soldier "straggler" would be discovered in the jungles of the Philippines, Guam, or other Pacific island. Their experience with decades-long primitive survival caught the interest of people around the world. Since we're facing an emergency survival situation in our future, I looked for things in their experiences in the jungle that would be useful to others. The greatest necessity for survival in hostile environments is a strong spirit. We had no advanced equipment. We did have basic knowledge of fabricating tools and necessities out of plants, brush, trees, and animal carcasses. But this knowledge doesn't help anyone with a weak spirit. We were all driven by a higher purpose, and that gave us hope. More importantly, it gave us a vision. When we awoke and saw the jungle "trap" we were in each day, WE DIDN'T SEE THE JUNGLE - WE SAW FINAL VICTORY! We did this every day for as long as we were out there; for some of us, more than 30 years! I once saw a verse in the New Testament that says, "The joy of the Lord is your strength." I believe I know this experience firsthand. I had a constant knowing that God (as I then understood him) was pleased with my dedication. I knew that it didn't matter what physical dangers were before me. Indeed, there were many! Poisonous snakes, lack of food, months-long monsoon rains, infections, broken bones from traversing the unforgiving terrain - these would defeat any man who did not have absolute faith that his God was guiding him. What does this mean? Exactly this: NOTHING IN THE WORLD CAN CHANGE YOUR MIND FROM FLINGING YOURSELF 110% INTO EVERY BATTLE AS A WARRIOR OF GOD! No army can frighten you, no injury can demoralize you, no lie from the enemy can make you give up, no bleak environment can make you feel unable to continue on. But how can one do that all day, every day, "24/7"? THIS IS IMPORTANT: YOU DON'T LET THE OUTSIDE WORLD ENTER YOUR SPIRIT! Did you get that? You can see all those things, your brain will acknowledge them, BUT YOUR SPIRIT IS ENVISIONING VICTORY - or PARADISE. You must be aware enough of the surroundings to make use of any available resources, you must work the land and build your defenses. BUT YOU NEVER LET YOUR SURROUNDINGS CHANGE WHO YOU ARE! YOU MUST INSTEAD INFLICT YOUR VISION INTO YOUR SURROUNDINGS. Never be passive. God pipes energy into his warriors when they refuse to yield to a spiritless environment. "He restores my soul." This is absolutely true. People ask me today, "How did you endure such isolation?" I tell them, "I was too busy to be lonely!" Some people talk of loneliness driving people to the brink of insanity. They have a weak spirit. God wants fighters, and he will make you a fighter once you turn your back on civilization's fears and RUN TOWARD every enemy. Your spirit will be fortified by God with the steel of the warrior. Your courage will follow your actions. You have to make friends with your environment. You "talk" to it - by the work you do with it, by observing it to see what good it can provide you for food and shelter. But always with an attitude of "being the boss." You must protect your spirit! The environment CAN be made to sustain your body - but it cannot sustain your spirit. You must maintain a "non-fraternizing" division between yourself and nature, like a commander with his troops: He talks to them, he briefly listens to them if they have vital information for him - But then he draws away from them. He must protect his vision - he can't afford to mingle with his troops in a social way. He doesn't want to become like them. They would bog-down his mind with details of drudgery that might demoralize his belief in absolute victory. The man in the jungle must likewise avoid sentimental fixations to the occasional "friendly" habitat he makes for himself, and keep ABOVE nature. Don't feel alien to your environment - this is unhealthy psychologically. Just remember to stay above it. "Isolation" is more a state of mind than a lack of people. You can feel very "connected" in almost a social way to primitive surroundings. The hours of labor and preparation required of the jungle dweller creates a feeling that he has "invested" himself into the jungle in a wordless kind of connection. This may be difficult for the civilized mind to understand. Just as a craftsman feels some part of himself entering the object he is making, the woodsman feels this mystical connection to his surroundings in a way that brings the hunger of loneliness under control, just enough to not threaten his sanity. And of course you can LITERALLY talk to the trees - one must converse with someone at times - Just make sure there's no enemy soldiers lurking behind them. At 9pm, January 24, 1972, Roman Quinata, Guam Commissioner of Talofofo Village reported to the Guam Police Department that a japanese World War II Straggler was brought to his office by Jesus M. Duenas, 43 years old, and Manuel Degracia, 36 years old, both residents of Talofofo Village. Lieutenant Mariano C. Cruz described the Straggler to be male about 5'6" tall, skinny, pale, appeared weak, short beard, hair roughly trimmed on the back, barefooted and dressed with dirty short pants and shirt. Messrs. Duenas and DeGracia told the police that they were checking their shrimp traps around 6:30pm, Jan 24, 1972, when they spotted a person up a hill. As they surprised the person, the person dropped a homemade net sack containing shrimp traps and charged them. After the hunters subdued the Straggler, they covered him with their rifles and marched him to Commissioner's Office. Duenas and DeGracia picked up the sack and traps and took the person to Duenas' ranch where they fed him before driving him to the Commissioner's Office. While the person was being transported to Agana Police Headquarters, the Straggler related to Lieutenant Cruz that it has been thirty years since he left his home in Japan. That he came to Guam before the U.S. invasion. He was an Army Sergeant. He had been hiding at the area since the invasion with two other japanese Stragglers, but later they separated. 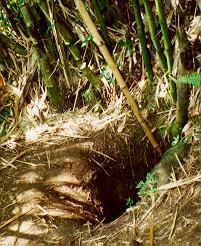 "We dug a cave in a bamboo thicket, but after a few months our food ran out. The others moved to a new hiding place where there was more food. We visited each other." About 8 years ago, he found both of them dead. "I believe they died of starvation". That the pants and shirt he was wearing were made of local fibers (hibiscus bark) and he made them himself. Smoke blackened utensils found in Yokoi's cave. During the interview at the Police Director's Office on the night of 24 January 1972, by Honorary Japanese Consul James Shintaku, he claimed his name to be Shoichi Yokoi, 58 years old, and he came originally from Aichi Prefecture, Nagoya, japan. Other records showed that he had been drafted in Nagoya in 1941. He served with the 29th Infantry Division in Manchuria from 1941 until he was transferred in 1943 to the 38th Regiment in the Mariana Islands. Remnants of the unit, all but decimated on Saipan, were sent to Guam in 1944. Yokoi arrived on Guam from Manchuria in February 1943. Never been married and gave Mr. Shintaku several names of relatives, he hopes are still alive in Japan. He was an Army Sergeant, attached to Supply corps, when he arrived on guam. He had been living in his manmade cave for the whole time and they were originally ten of them. However, for the last 8 he has been alone and before that he was with his two companions that died eight years ago. He has known for twenty years that the war was over, but he was afraid to come out of hiding. Sgt. Shoichi Yokoi, a Japanese imperial army straggler who lived in the jungles of Guam for 28 years after World War II ended, died at 5:07 pm Monday Sept 22, 1997 of heart failure at JR Tokai General Hospital in Nagoya Japan. He was 82. Yokoi lived in a tunnel-like, underground cave in a bamboo grove until Jan 24, 1972, when he was discovered near the Talofofo River by hunters. Yokoi, who had been a tailor's apprentice before being drafted in 1941, made clothing from the fibers of wild hibiscus plants and survived on a diet of coconuts, breadfruit, papayas, snails, eels and rats. "We Japanese soldiers were told to prefer death to the disgrace of getting captured alive," Yokoi said in 1972. "The only thing that gave me the strength and will to survive was my faith in myself and that as a soldier of Japan, it was not a disgrace to continue on living," Yokoi said in 1986. No one in the history of humanity, except stragglers later discovered in Philippines, has equaled his record. Few have struggled with loneliness, fear, and self for as long as twenty-eight years. According to the records about Guam (called Omiya-jima island by Japan), Sergeant Yokoi's unit was located in the Fena Mountain region of the upper reaches of the Talofofo River when the Americans landed on the night of July 21. The Japanese troops made a night attack on the Americans in Nimitz (Showa) Bay; but having managed to bring U.S. tanks on shore, the Americans were on the offense. At this juncture Yokoi's unit already faced a situation in which they would soon be forced to fight until the last man had been killed. Some of them, managed to escape to the west shore of Nimitz (Showa) Bay and ultimately to rejoin the main force in Agana (Akashi). But Yokoi journeyed to the Talofofo area to which he says "I hid in the mountains." A tailor when he was conscripted in 1941, Sergeant Shoichi Yokoi said he wove cloth from tree bark fibre from Guam's pago/hibiscus trees and made himself trousers and a jacket. He used a pair of scissors he had through the war to tailor the clothes and to cut his hair. He was heavily bearded. Besides the scissors, the only things he kept from his days as a soldier were a waistband embroidered by his mother and a Japanese flag, both of which he had hidden in the cave. Present during the interview were Guam Police Director J.C. Quintanilla, Guam Governor Carlos G. Camacho, Major P.A. Camacho, Lieutenant M.C. Cruz, Guam American Red Cross Representative, Immigration & Naturalization Representatives and Pacific Daily News Reporters. After the interview, Sergeant Yokoi was transported to Guam Memorial Hospital by Dept Public Safety-1 ambulance for physical examination. Doctors at Guam Memorial Hospital said his blood pressure, heart and pulse were normal, but he appeared to be anaemic, as result of his salt-free diet. Sergeant Yokoi is the third former Japanese soldier to be found on Guam long after the war. Two others were discovered 16 years prior to 1972. On January 25, 1972, the Guam Police organized a search party to search the hiding place of Sergeant Yokoi and the hiding place where Sergeant Yokoi's companions died. The search party left Talofofo Village in police jeeps as far as the end of a long dirt road through a crude map drawn by Sergeant Yokoi. After about two hours walk from where the police jeeps were parked, Sergeant Yokoi's cave was found. About twenty minutes walk from Sergeant Yokoi's hiding place was the cave where his companions died. 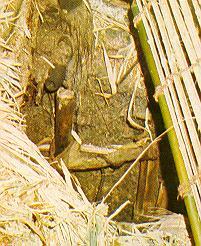 Sergeant Yokoi's hiding place is on a little bamboo grove on the side of a rolling slope which ended in a small stream. The entrance to the shaft of the tunnel was cleverly concealed. Bamboo slats were tied over the top and bamboo leaves scattered covering the opening of the shaft. The shaft is about 20 inches wide and a drop of about 8 feet. The tunnel runs about 10 feet deep southwest. His stove, toilet and resting place were photographed and many homemade implements were found and seized. On January 27, 1972, the search party returned to the tunnel with U.S. Naval Magazine Bomb Disposal Team. Two japanese handgrenades were dismantled and a 155mm American shell was removed from a second tunnel where Sergeant Yokoi's companions died. On the same day, Detective Scharff again explored the same tunnel and found the bones and skulls of the two companions lying close side by side. Bones and skulls were turned over to Dr. Orlando Varona for study. Sergeant Yokoi was hosted at the Government House by Governor and Mrs. Carlos G. Camacho. Admiral Paul Pugh, commander Naval Forces Marianas paid a visit to Sergeant Yokoi at the hospital. On Jan 27, 1972, Mr. Kazunari Nakamura, director of Repatriation of the Ministry of Health and Welfare and Mr. Masato Abe, assistant to Mr. Nakamura, arrived in Guam via Japan Self-Defense plane. On February 2, 1972, at 12:00 Noon, Sergeant Yokoi departed Guam via Japan Special Flight, accompanied by Messrs. Nakamura, Abe and Japanese TV and News Reporters and Photographers. The remains of the two companions of Sergeant Yokoi were taken back to Japan on the same flight. He brought back his army-issue rifle, which he said he wanted to return to "the honorable Emperior," adding "I am sorry I did not serve his majesty to my satisfaction." Yokoi said he was from a village in Aichi prefecture, but when officials checked they found that his home town had been amalgamated in Nagoya, Japan's third largest city. Officials at the relief bureau there found his name listed in proper Japanese "alphabetical" order in a list of the prefecture's 98,000 war dead. He was listed as having been killed Sept. 30 1944. In November 1972, Yokoi married 44 year old Mihoko and return to Guam for his honeymoon. He has returned to Guam several times over the years. Yokoi traveled around Japan giving lectures on survival topics and even starred in television special, "Yokoi and the Seven Beauties," in which he taught Japanese women about the art of survival. He ran unsuccessfully for the House of Councillors - Parliament's upper house - in 1974. On January 24, 1972, two hunters captured a Japanese soldier who had been hiding in the jungles of Guam since the American forces took the island in 1944. His name was Shoichi Yokoi, and in the summer of 1944, he had retreated into the jungle rather than surrender, and had been there ever since. He resided in a cave he had dug from a bamboo thicket, and lived on a diet of nuts, mangos, papaya, breadfruit, snails, and rats. Having been a tailors apprentice before the war, he was able to fashion clothing and footwear from tree bark, and coconut husks using needles he made from nails, and buttons he made from wood. He made a calendar from a tree trunk that he notched it at every full moon, and though he had read from a leaflet that the war had ended, he was determined to avoid capture until the Imperial Japanese Army returned. Once captured, he was taken to Guam Memorial Hospital were doctors who had examined him were surprised to find him in good health. Evidently, his first question was, "Tell me quick, is Roosevelt dead"? When news of his capture reached Japan, he became an instant hero. People gave him gifts that totaled $80.000, and job offers and marriage proposals poured in. But there were some dissenting voices as well. Some felt that since so many Japanese men hadn't come home from the war, why was so much attention being given to this one man? Others found his devotion to the Emperor antiquated and embarrassing. Some wondered that if he were such a good soldier, why hadn't he committed Hara-Kiri when Guam fell. He was surprised and a little saddened at how his country had changed. He was quoted as saying, "The glories of nature that I used to know have all disappeared. Instead up in the sky we have this thing called smog. On Earth, cars are killing more people than the war". Most disturbing to him were modern Japanese women. "They are monsters whose virtue is all but gone from them, and who screech like apes". Before the war they were, "virtuous, and obedient to the commands of menfolk, lovely to look at, gentle and retiring. Eventually, his countrymen began to forget about him, and he bought a house with the money his countrymen had donated. He settled down with Mihoko Hatashin whom he married. He described her as a nice old-fashioned Japanese girl. TOKYO (CNN) -- A Japanese soldier who became an instant national hero after it was discovered that he stayed in the jungles of Guam for 26 years after the end of World War II, has died of a heart attack at age 82, hospital officials said Tuesday. Shoichi Yokoi died Monday at a hospital in the central city of Nagoya. He became a national hero on his return to Japan in 1972 for his dramatic tale of survival and his adherence to the former Imperial Army's code of never surrender. His first words upon arriving in Tokyo -- "It is with much embarrassment that I return" -- were broadcast nationally and instantly became a popular saying. Yokoi's exploits in the jungle fascinated the nation. The Japanese, in the throes of the post-war industrial boom, were intrigued by his bare diet of nuts, berries, frogs, snails and rats, and how he wove materials from tree bark. His return triggered a search for other Japanese soldiers left from the war, and turned up another straggler in 1974, this time in the Philippines. Unlike Yokoi, whose rifle had rusted and become useless, former Lt. Hiroo Onoda had kept a working firearm and was accused of killing several villagers before he was discovered in the Philippine jungle. Yokoi, a former sergeant, was drafted into the army in 1941 and sent to northeastern China, and later to Guam. Japan occupied Guam during the war and most of its 22,000 troops were killed when U.S. troops recaptured the island in 1944. Two local hunters discovered him in January 1972 in a remote Guam jungle. He was wearing a pair of burlap pants and a shirt which he said he had made from the bark of a tree. He was repatriated to Japan a month later, where he started life over in a country and a world he hardly knew. Japan had then become a nation with a limited "self-defense" force instead of an army, and was just beginning to emerge as an industrialized power. Upon his return, Yokoi, who had been reported as killed in action, was dumbfounded by the changes that had occurred since he left on a military transport more than a quarter century earlier. At the first news conference since his homecoming, Yokoi, surrounded by reporters and photographers after nearly three decades in complete jungle isolation, appeared bewildered and was unable to answer questions posed to him. He contracted an arranged marriage in November 1972, and traded his solitary cave in Guam for a home in Aichi Prefecture with his new wife Mihoko. He became a regular commentator on television programs, where he discussed survival skills. He wrote a best-selling book on his experience in Guam and in 1974 ran unsuccessfully for a seat in Japan's upper house of parliament. Hiroo Onoda was born in the town of Kainan, Japan in 1922 and when he turned seventeen, he went to work for a trading company in China. In May of 1942, Onoda was drafted. Unlike most soldiers, he attended a school that trained men for guerilla warfare. At a time when becoming a prisoner of war was considered by the Japanese to be a crime punishable by death, Onoda was taught that this action was okay and to stay alive at all costs. On December 26, 1944, Apprentice Officer Hiroo Onoda was sent to the small tropical island of Lubang, which is approximately seventy-five miles southwest of Manila in the Philippines. His orders were straightforward. He was to do anything to hamper enemy attack on the island. This included destroying the Lubang airport and the pier at the harbor. He was sent in alone, ordered not to die by his own hand, and was told to take as many years as was needed to accomplish his mission. When Onoda landed on the island, he met up with a group of Japanese soldiers that had been sent there previously. The officers in this group outranked Private Onoda and prevented him from carrying out his assignment in a timely manner. This just made it all that much easier for the Americans to take control of the island when they landed on February 28th. Within a short period of time, all but four of the Japanese soldiers had either died or surrendered. Onoda, having just been promoted to Lieutenant, ordered the men to take to the hills. The war ended shortly thereafter, but the four soldiers would not know it for quite some time. Four surviving soldiers cannot fight much of a war. Basically, they can only fight for their survival. Realizing that it would be unwise to stay in any one location for a long period of time, they developed a circuit, of sorts, in which they moved from point to point. A long stay in any particular place would be three to five days, the length of time was determined mainly by the supply of food. During the torrential rainy season, no one came into the mountains, and they were able to build a camp and sit still for a longer duration. Their main source of nourishment was bananas. They did supplement their diet with other fruits and by hunting wild water buffaloes, wild boar, wild chickens, and iguanas. They had a preference for beef, but they could not hunt too many of any animal because the sound of their gunshots would quickly indicate their position. The first of the four to go was Private First Class Yuichi Akatsu. He got fed up with the whole thing and stormed off in September of 1949. The remaining men figured that there was no way that this weakling could survive on his own. Yet, unbeknownst to them, Akatsu managed to live six months on his own before surrendering to the Philippine Army. In 1950, the remaining three found a note left by Akatsu stating that he had been greeted by friendly troops. He even led a group of soldiers into the mountains in search of the remaining men. Onoda and his men quickly concluded that Akatsu was now working with the enemy and retreated to the other side of the mountain. In 1952, letters and photographs of family and friends were dropped all over the island from an airplane. The soldiers concluded that the enemy had finally outdone themselves with this clever trick. To the eye of those trained in guerilla warfare, this had to be a hoax. In June of 1953, Corporal Shimada, another member of their party was shot in the leg during a shootout with some fishermen. Onoda nursed him back to health, but on May 7, 1954, Shimada was killed instantly from a shot fired by another search party sent in to find the men. Ten days later, more leaflets were dropped. A loudspeaker blurted out " Onoda, Kozuka, the war has ended." Clearly this was another trick by the Americans. They were sure that the war was still on and they intended to get even with the enemy for Shimada's death. Onoda and Kozuka were positive that the Japanese would be landing on the island any day and that control would be taken back from the Americans.
. First, they were trained to treat everything with suspect. Second, it was well understood that it could take one hundred years to win the war and that Japan would never surrender until every last Japanese citizen had been killed. In their minds, there were still Japanese citizens alive, so, clearly, the war must have been still going on. Whenever they needed crucial supplies, the two men would "requisition' them from the islanders. You and I call it armed robbery, but since this was considered a time of war, these actions were considered acceptable. The islanders had several names for them, including "mountain bandits" and "mountain devils". The islanders had good reason to fear them since many citizens of the island were wounded or killed in skirmishes with the two soldiers.. In late 1965, the Onoda and Kozuka requisitioned a transistor radio and listened to reports from Peking. Oddly, with their minds still trapped in 1945 war time, they did not believe anything that they heard on the radio regarding military or foreign relations. Yet, they followed the horse races and understood that Japan had risen to be a great industrial power. Each year, in an effort to continue on with their military assignment, Onoda and Kozuka would burn piles of rice that had been collected by the farmers. On October 19, 1972, they went about their usual business, but decided to burn one last small rice pile before they went on their way. This was a big mistake. This gave the police ample time to get there and they shot Kozuka twice. One of the bullets went through his heart and he was killed. Onoda took to the woods once again. He resolved that if he encountered the enemy, he would shoot to kill. The search parties, loudspeaker announcements, and the dropping of leaflets intensified. They left magazines and newspapers behind, many detailing the incredible funeral that was held for Kozuka back in Japan. Yet, to no one's surprise, Onoda did not buy their pleas. For almost one more year, Onoda continued to live on his own. He was prepared to die on the island. Then, February 20, 1974, he encountered a young Japanese university dropout named Suzuki living alone in a tent. Suzuki had left Japan to travel the world and told his friends that he was "going to look for Lieutenant Onoda, a panda, and the Abominable Snowman, in that order. Onoda approached cautiously and the two soon struck up a conversation that lasted many hours. The two became friends, but Onoda said that he was waiting for orders from one of his commanders. Suzuki left and promised that he would return. And he did. On March 9, 1974, Onoda went to an agreed upon place and found a note that had been left by Suzuki. Along with the note, Suzuki had enclosed two photos that they had taken together the first time that they met along with copies of two army orders. The next day, Onoda decided to take a chance and made a two-day journey to meet up with Suzuki. His long hike paid off handsomely. Suzuki had brought along Onoda's one-time superior commander, Major Taniguchi, who delivered the oral orders for Onoda to surrender his sword. Hiroo Onoda's thirty-year war was now over. He returned to Japan to receive a hero's welcome. He was a media sensation and was hounded by the curious public everywhere he went.